Authors outline the political system options facing the country—a future of European-style big government or a future founded on values of freedom and limited government. In fact, the authors describe this choice in passionate terms as “a battle for the soul of America.” With the upcoming election around the corner, the publication of “Freedom Manifesto” cannot be more relevant than it is right now. 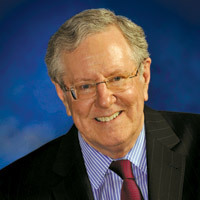 Steve Forbes is chairman, CEO and editor in chief at Forbes Media, an internationally respected authority in the fields of economics, finance and corporate leadership, and is the author of several books on business and the free market. Forbes and Elizabeth Ames, a writer and journalist, look at the role of the government and the morality of free markets. They argue that “Big Government,” bloated and bureaucratic, is less able to provide compassion and morality than the free market. Instead of assuring fairness, “Big Government” promotes favoritism. Instead of furthering opportunity, it stifles economic growth and innovation. And instead of unleashing innovation and material abundance, its regulations and price controls create rigidity and scarcity. The only way to a truly fair and moral society, the authors say, is through economic freedom—free people and free markets. Forbes contends that a perception persists that “Big Government is a prerequisite for a humane society. Calls for more government are almost always couched in morality rhetoric. Big Government is synonymous with ‘compassion,’ the only way to protect against the destructiveness of markets, the way to provide genuine security and a safety net for the less fortunate.” In the book, he seeks to turn this perception on its head. 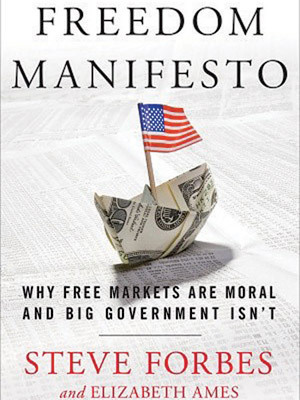 In “Freedom Manifesto,” the authors provide a fully developed framework of “first principles” for a true understanding of the real moral and ethical distinctions between more and less government. FedEx or the Post Office? The Spirit of Reagan—or Obama?